MAST is a suite of tools and approaches that supports the collection and management of land rights and resource information. It integrates mobile applications and a web-based data management platform with participatory on-the-ground approaches. 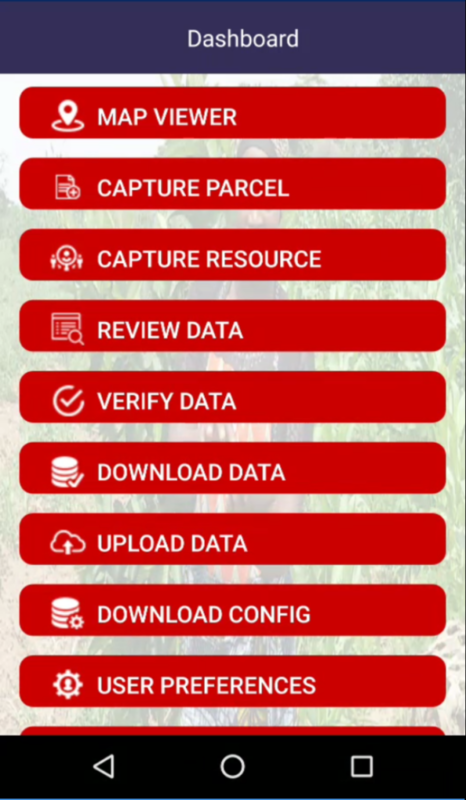 The mobile application enables field teams to collect spatial, attribute, and multimedia data about land parcels and natural resources. 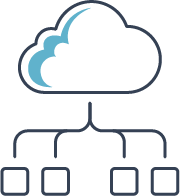 Data is collected and stored on mobile devices and transferred to a cloud-based platform for data processing and management. This platform provides advanced functionality that has been reviewed, processed, and approved for the preparation of land ownership certificates. 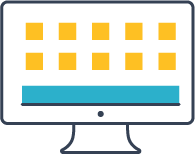 The MAST administration tool makes it easy to create and manage MAST users. 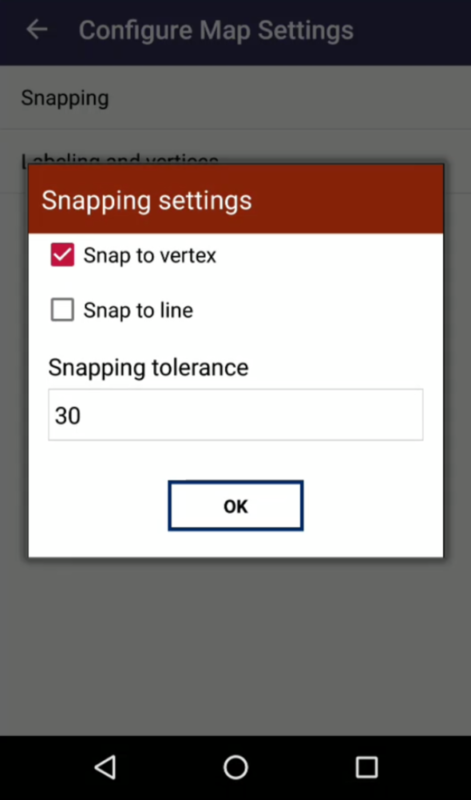 The tool enables administrators to establish a new mobile survey project, add data collector users, and add new spatial data layers. Users and data layers are linked to each project, which is then made available to authorized users – both those in charge of managing data and those that are assigned to collecting data in the field. 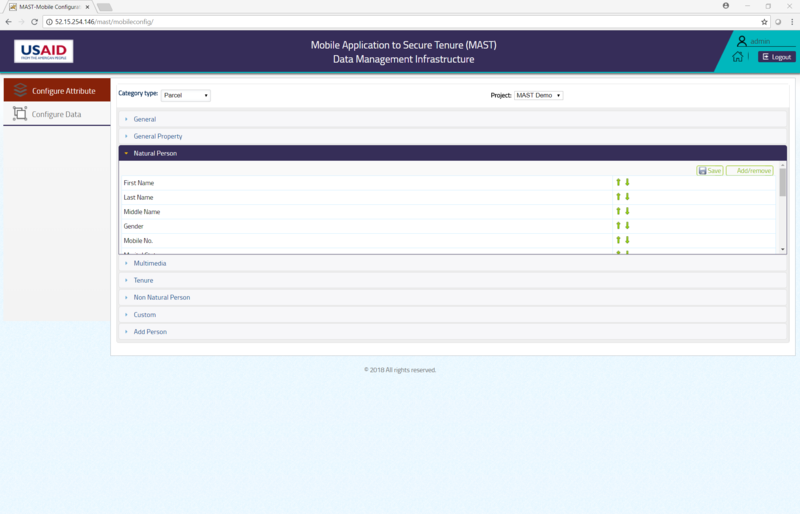 The MAST configuration tool contains all the settings necessary to set up the mobile application to meet your project’s needs. 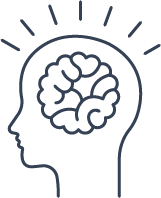 This tool enables users to select and define attributes, as well as define and upload base map layers. 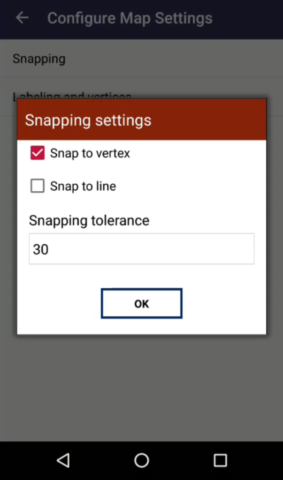 These settings are then synced to MAST Mobile. The MAST data management tool allows authorized users to validate, edit, and approve collected land rights data. Web-based mapping tools, including a GIS tool, allow users to query and edit data. A new registration module has been added to MAST to administer land records after they have been finalized and/or formalized through a community mapping process. 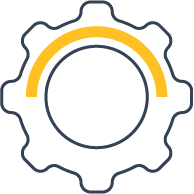 This tool provides users of MAST with a tool that can be administer several subsequent registration transactions including sales, leases, mortgages, gift, and parcel splits. 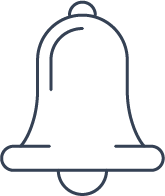 This provides an important tool to the MAST technology stack and can be customized to meet requirements of a specific context. 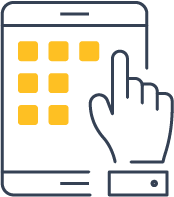 The ‘Tasking Manager’ tool allows administrators and project managers to plan out their mapping tasks, divide a project area into distinct geographic areas, and assign them to specific mobile users. Once an area is assigned to a specific user, it will be available in their mobile device to facilitate mapping within a specific geographic area. Available for parcel module only. 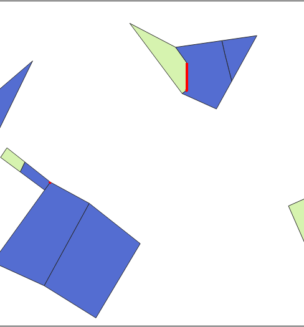 Topological tools have been added to MAST to validate that topology of parcels. 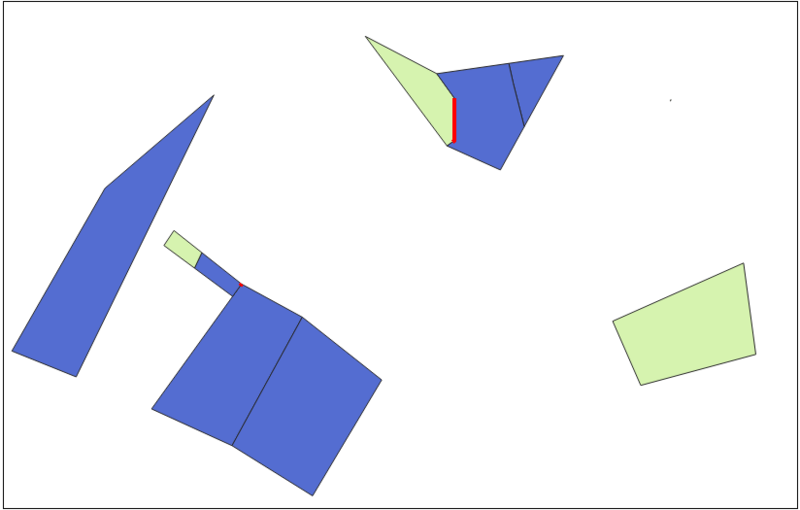 MAST validates topology according to simple rules to avoid errors like overlaps, gaps, and crossed lines. Validation is run automatically on a daily basis or it can be started by an administrator if immediately necessary. Errors are visualized in the Data Management map view and logged in an error file. Available for parcel module only. USAID has taken advantage of FOSS software plugins for QGIS, such as the Offline Editing tools, to allow users to sync data to their desktop, work offline, and then commit that work back to the MAST server. This extends the functionality of MAST by allowing users to edit spatial data offline in instances where online access and bandwidth may be cumbersome or limited. The MAST reporting tool provides a series of statistical and template reporting tools. Statistical reports help managers track performance of field surveys and the land rights documentation process, while template reports – which include map data – are used to validate information and can be customized to print land certificates. 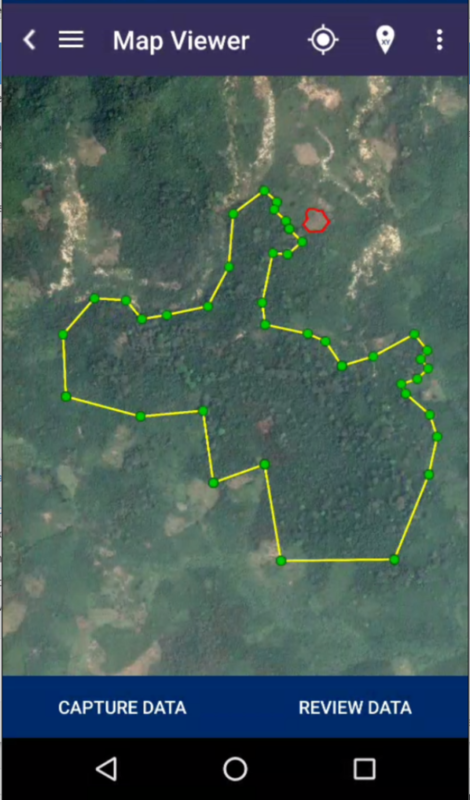 MAST Mobile is an Android-based application that can be used to capture land rights information in the field. 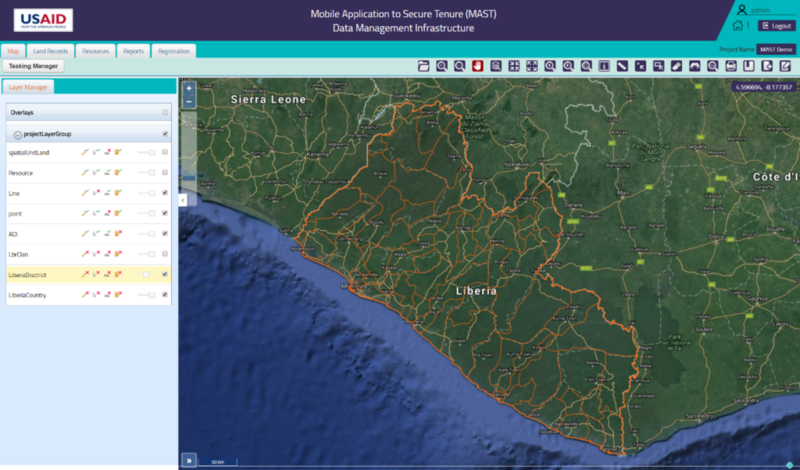 The MAST Mobile application provides an intuitive user experience for querying map layers and capturing spatial, attribute, and multimedia information. MAST Mobile provides map visualization features that allow users to view all parcels that have been mapped or surveyed in the field. Spatial information that is collected by MAST can be overlaid on top of base mapping data, such as aerial photography or satellite imagery. 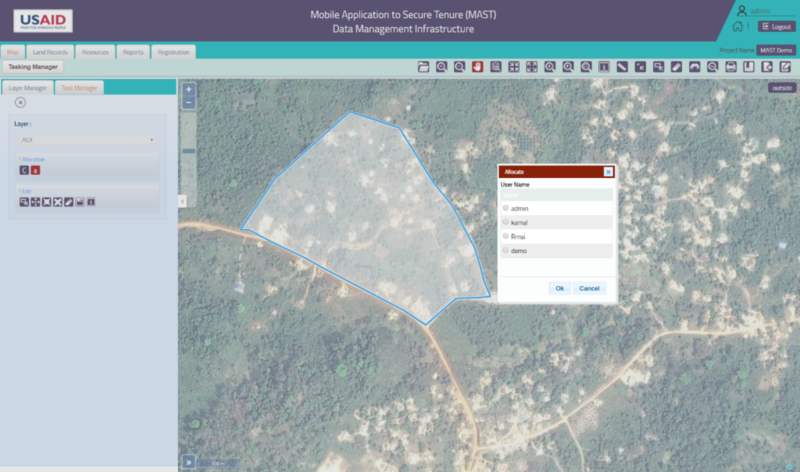 MAST Mobile ‘Parcel Mapping’ module captures land rights information, including spatial, alphanumeric, and multimedia information. 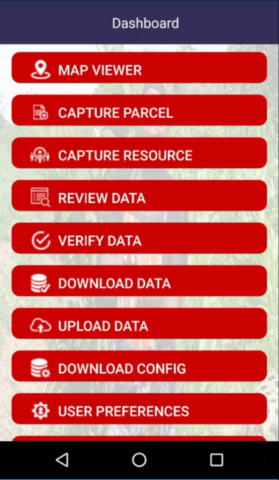 The parcel data capture tools allow users to collect geospatial data by either drawing on the screen, using a device’s native GPS tools or link to external GPS devices to capture coordinate locations. This tool can be used for systematic or spot adjudication. MAST Mobile resource mapping module captures land use and resource information. This includes capture of spatial and tenure or occupancy information for a variety of geographic features, including communal land, community forests, infrastructure, and other important features. This tool can be used to capture important information to help communities understand their land and local resources. 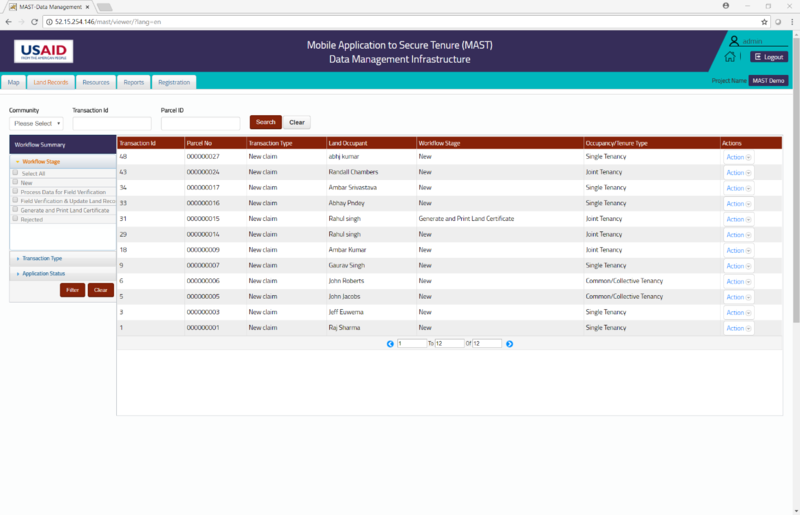 MAST Mobile also allows users to query map layers to explore captured data before it is uploaded into the data management application. Users can also edit captured spatial and attribute data in the field before syncing data to data management infrastructure. A series of user preferences tools allow users to change user settings of the mobile application including: map display properties, layer management, synchronization options, linkage to Bluetooth devices, selection of tasking areas, and languages. MAST Mobile supports offline field data capture for collection in areas with no mobile or WiFi signal. 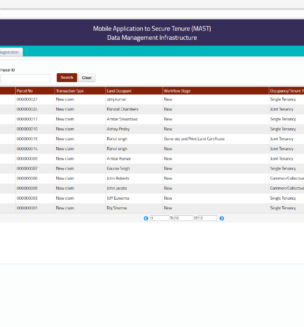 Data is stored in a mobile database and transferred to the MAST data management platform when the device is connected to a mobile or WiFi network. Use the mobile app to map community land parcels or common resources using GPS or touchscreen. MAST records attributes of the land and occupants in the field, online or offline, and then syncs to the data management platform. After parcels are recorded and finalized, land administrators can keep them up to date through a simple registration system. Land can be sold, leased, mortgaged, subdivided, and gifted through a set of easy to use workflows. Administrators can log official paperwork with the transactions. Land administrators can connect their preferred desktop GIS software, like QGIS or ArcGIS, directly to the MAST database for editing and error correction. MAST will prevent restricted edits and can even work offline with the right set of plugins. 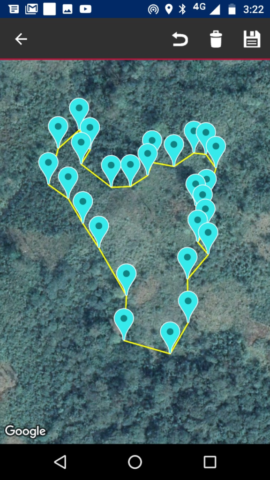 MAST allows users to easily collect spatial data in the field using GPS on a mobile device, as well as GPS receivers connected to devices via Bluetooth. 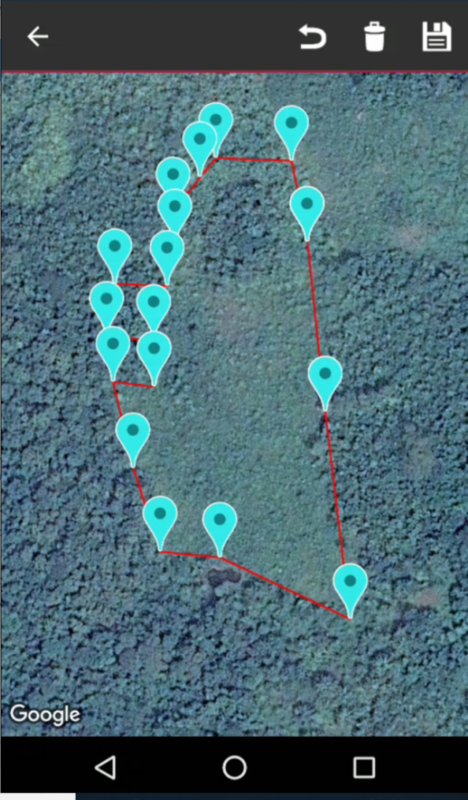 If a project requires higher GPS accuracy than is available on board a mobile device, external GPS receivers can be configured to work with MAST. 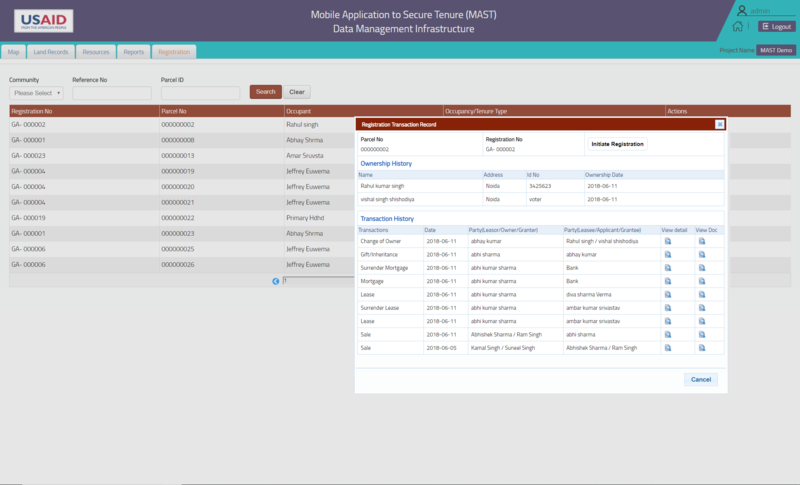 MAST works seamlessly in offline mode with spatial data and its associated attributes stored in an SQLite database. 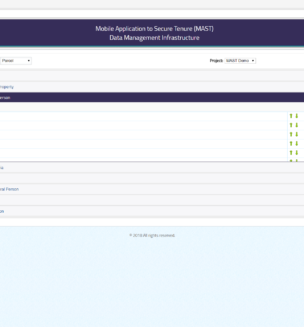 MAST allows users to synchronize data collected while in offline mode to the web-based data management platform. This can be done manually or at a frequency determined by the user, whenever connectivity is available. MAST adheres to the Land Administration Domain Model (LADM) and captures location information of geographic objects and selected property, parties, and rights information. The data model facilitates the customization of MAST for different contexts by allowing users to define and add attributes to predefined tables. 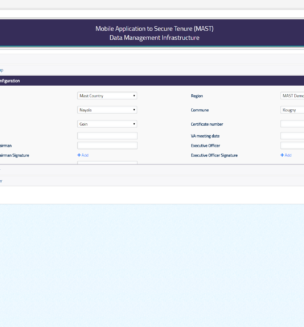 MAST allows authorized users to upload data to the data management platform from a variety of mobile devices. MAST also checks attribute data for inconsistencies and validates spatial data according to set rules. Validation errors are tracked and displayed in MAST for project administrator follow-up and correction. 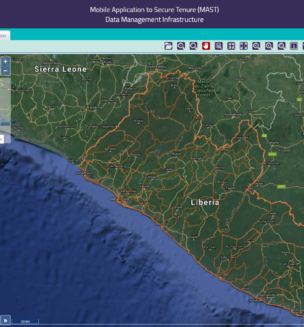 With MAST, users can read, manage, and store spatial and attribute data that has been collected in the field. 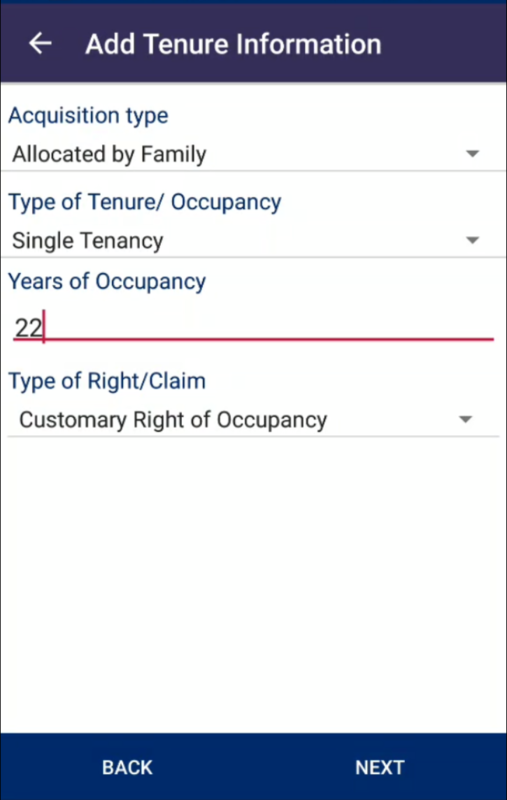 Authorized users can also review, edit, and approve the data related to each land record, along with their attributes and multimedia information. 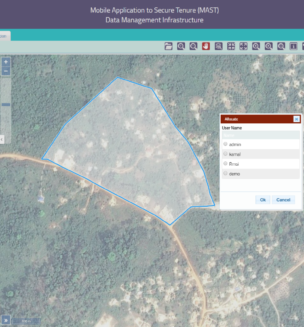 With MAST, users can view project information and display collected land rights data according to unique identifiers. MAST provides an integrated workflow for editing, processing, and approving land record data. 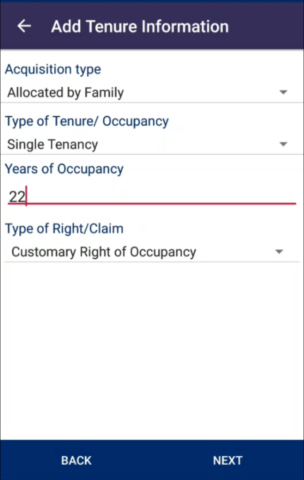 Data of properties and other spatial units can be filtered according to their status. 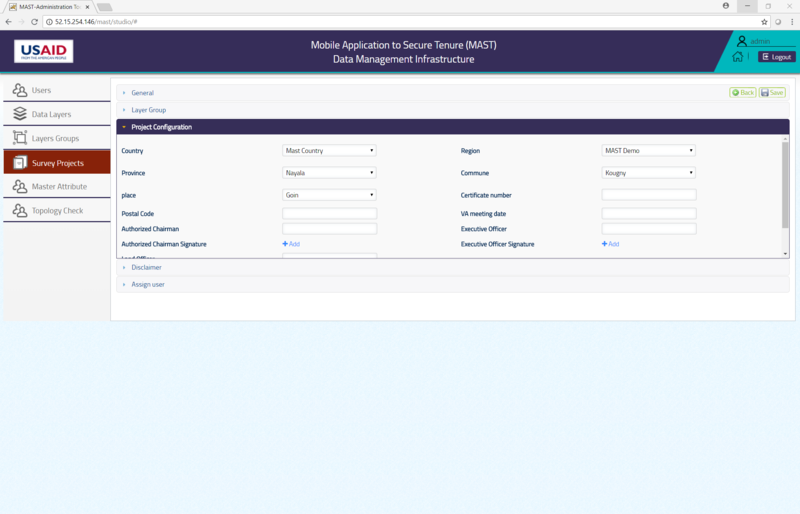 Utilizing API and RESTful web services, MAST can be extended and integrated with other software. MAST works with specific services to allow consumption and integration of data to and from the data management platform. The MAST Data Management Platform API is Open Geospatial Consortium compliant and extends the well-known Geoserver API to facilitate easier interoperability between MAST and third-party systems. MAST provides several layers of security by utilizing robust security measures. These measures operate at the database-level to protect personally identifiable information from unauthorized users. 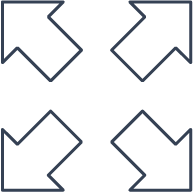 Security within the database is managed through business logic and is provided on a per user role basis. 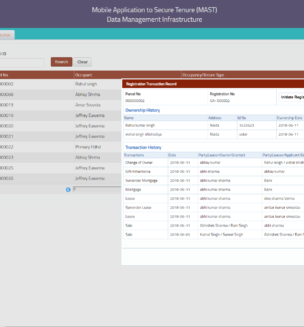 The data management platform allows administrators to define permissions for users for viewing, editing, and creating data, and assign credentials to users of mobile devices.